Coach Mike Friday and his U.S. Eagles can’t afford another letdown against a powerhouse nation. The red, white and blue face the defending USA Sevens champion Fiji at 12:50 p.m. today at Sam Boyd Stadium. JACOB KEPLER/LAS VEGAS REVIEW-JOURNAL South Africa's Justin Geduld scores against the United States during their final pool-play match in the USA Sevens rugby tournament at Sam Boyd Stadium on Saturday. The Americans lost 29-0, but recovered to beat Kenya in the quarterfinals and advance to today's semifinal against defending champion Fiji. The setting wasn’t right Saturday for the host nation of the USA Sevens rugby tournament. 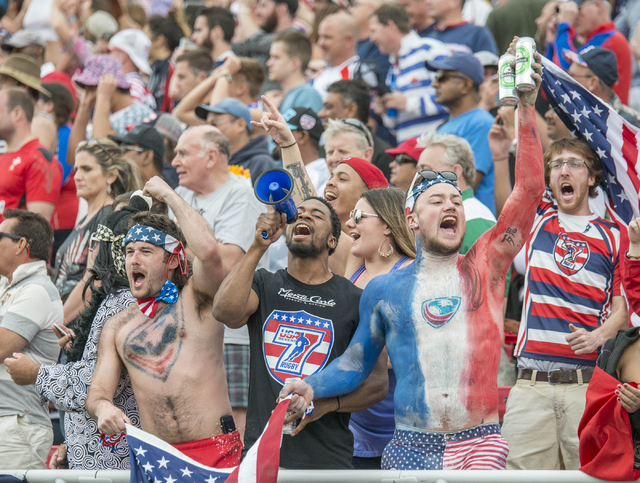 Mike Friday, the coach for the U.S. national team, still gets chills when he recalls the atmosphere before his Eagles took on South Africa in the final pool game of last year’s competition at Sam Boyd Stadium. Friday will probably want to forget this year’s pool match against the Blitzboks. 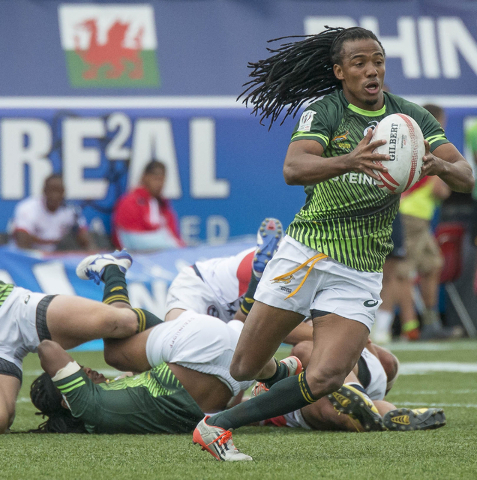 With dark clouds and gusty winds hovering over Sam Boyd on Saturday, the Eagles laid an egg in a 29-0 loss to South Africa to close out the Pool D stage. In 2015, the United States and South Africa finished in a 19-19 tie on a sunny day with a fighter jet flying over during the anthem. The fighter jet didn’t make an appearance Saturday, and the announced crowd of 35,716 wasn’t rocking. South Africa dominated from start to finish and didn’t let the speedy Americans get open space. Luckily for the Eagles, they clinched their ticket to the quarterfinals before the game started because Wales defeated Canada. The U.S moved on with a lackluster 1-1-1 record, while South Africa went 3-0. The U.S recovered from the dreaded performance to defeat Kenya 26-14 in the quarterfinals to advance to the semifinals for the second straight year. Friday and his Eagles can’t afford another letdown against a powerhouse nation. The red, white and blue face the defending USA Sevens champion Fiji at 12:50 p.m. today. 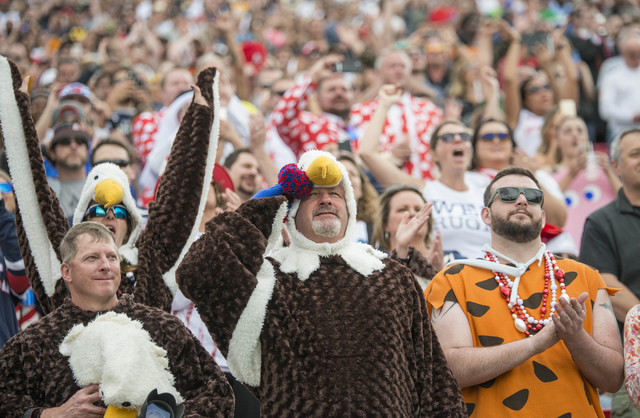 Waisale Serevi, the Michael Jordan of rugby sevens and Fiji legend, watched the United States’ disappointing effort against South Africa, but the loss didn’t change his views on the Eagles. 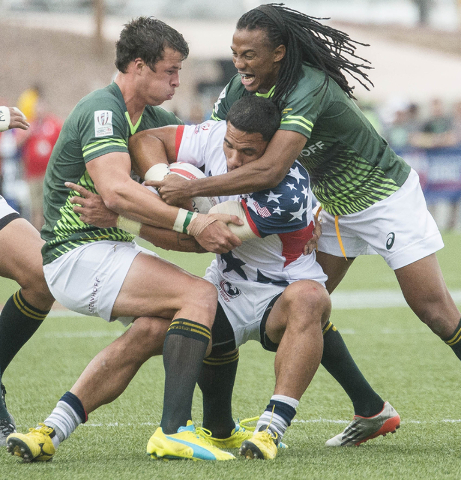 Serevi is rooting for the U.S to succeed in rugby. The Fijian great has hosted rugby camps at universities across the United States. Perry Baker, a star wing for the U.S., tried to sprint through the South African defense early in the first half. The hole closed quickly, and Baker ran into a wall. That set the tone for the game. 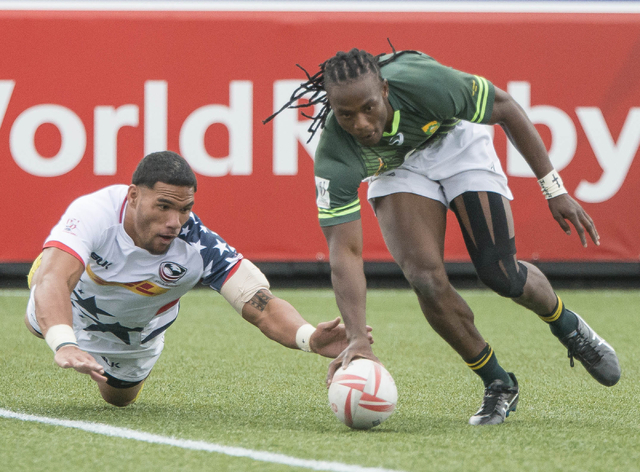 The Blitzboks dominated the time of possession to keep the ball away from American speedster Carlin Isles. The U.S. will face the same type of skill set against Fiji. Serevi said the United States needs to improve on defense and not rely solely on speed to compete with teams such as South Africa and Fiji. “Speed is important, but defensively, they need to work hard on defense,” Serevi said. “They gotta try to be consistent all the time to get to the next level. Serevi enjoys seeing the U.S. climb up the ranks, but he’ll be on Fiji’s side today. United States vs. Fiji, 12:50 p.m.
South Africa vs. Australia, 1:12 p.m.